If modern decor is your choice, check out this ultra-modern outdoor fireplace in the form of a single torch flame. 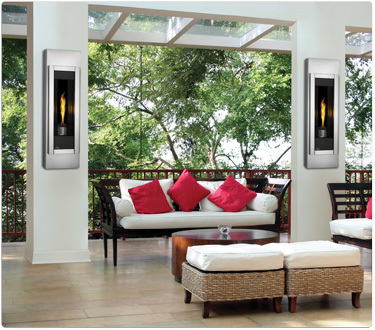 The single flame emits up to 6,000 BTUs per hour, keeping your outdoor sitting area cozy on chilly autumn evenings. This exclusive design is manufactured by Napoleon, requires no venting, and is designed for versatile installation, new construction, and renovation projects. It's constructed of stainless steel in combination with powder coated and porcelain materials that stand up to the harshest of outdoor climates. The standard set includes a full stainless steel front and a mounting cabinet. This fireplace measures 49-11/16" high, 15" wide, 7-9/16" deep, and weighs about 68 lbs.